OVERVIEW: The fate of the defendant lies within the truth in the gripping and illuminating story Marshall , coming to Digital on December 26, 2017 and Blu-ray™, DVD and On Demand on January 9, 2018, from Universal Pictures Home Entertainment. A thrilling whodunit, Marshall stars Chadwick Boseman (Black Panther), Josh Gad (Murder on the Orient Express), Kate Hudson (Almost Famous) and two-time Primetime Emmy award-winner Sterling K. Brown ("This Is Us") delivering what critics call "Oscar-worthy performances in one of the most important films of the year" (Rachel Smith, FOX). Fifty years after Thurgood Marshall was sworn in as the first African American Supreme Court Justice in 1967, this riveting and timely film invites audiences to discover an untold chapter of an inspirational figure who shaped modern American history and serves as a moving reminder of contemporary race relations. 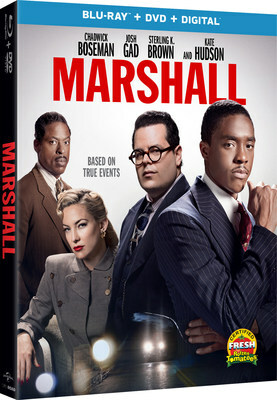 SYNOPSIS: Marshall is based on the incredible true story of future Supreme Court Justice Thurgood Marshall and one of the landmark cases of his life. It follows the young lawyer (Boseman) to conservative Connecticut to defend a black chauffeur (Brown) charged with sexual assault and attempted murder of his white socialite employer (Hudson). 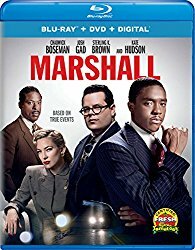 Muzzled by a segregationist court, Marshall partners with a courageous young Jewish lawyer (Gad) and together they mount the defense in an environment of racism and anti-Semitism.